For the last few months, I have had an itch. As I continue to settle into my new home and get properly set up, I have been itching to go back to the kinds of recipes that made me fall in love with writing this blog. The demands are real. I live in a remote island. Ingredients are not readily available. Things are expensive, and massive changes on the home and business front mean that I have much more on my plate than ever before in my life. Yet, somehow, getting my hands dirty making things from scratch is just what I do best. And though it takes more effort and cleanup, the process and results are always delightful. You see, as I sat here to write this post, I realized that this is the life I have always dreamt of. A life in a well-used, well-stocked kitchen and people to share my food experiences with. 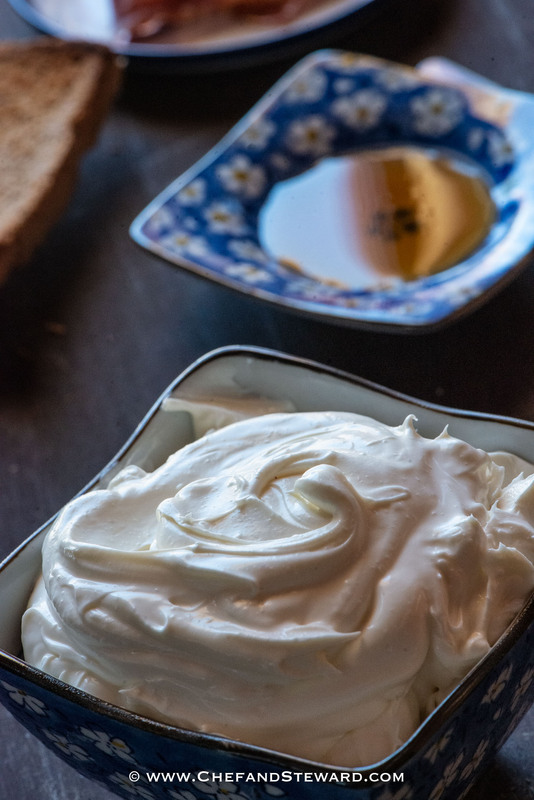 This recipe for marscapone (an Italian, saltless high fat cheese, softer and creamier than cream cheese, and perfect for lots of sweet applications as well as savory scratches my itch in the most soothing way. The best part is that is uses only two ingredients! Remember to share this post! It is generally cheaper to make marscapone than to buy it. And depending on where you live, you may not be able to get your hands on great quality marcsapone in the supermarket anyway. This is the base for the popular Italian dessert, tiramisu, (which I have never made), but may do so one fine day. 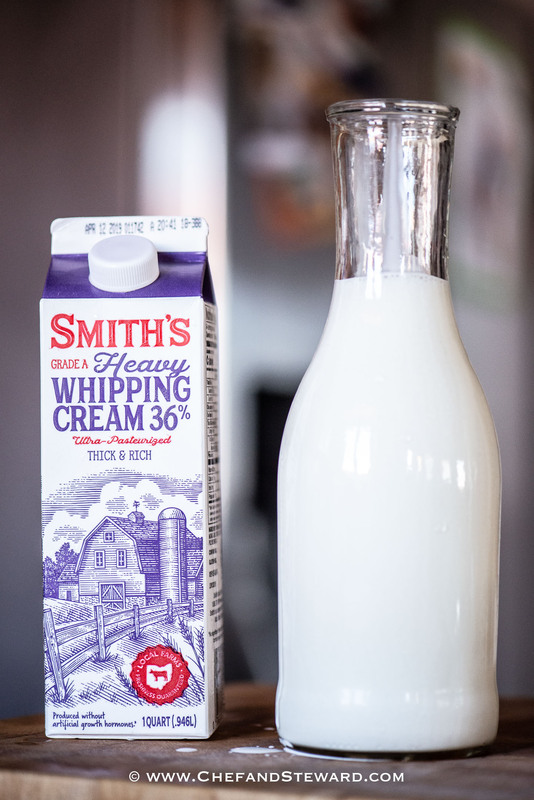 However, I love to use it instead of cream cheese because it is less salty and sweetens nicely for a smooth rich creamy fat bomb. The lemon juice in this recipe actually cuts through all the fat and makes it far from cloying. 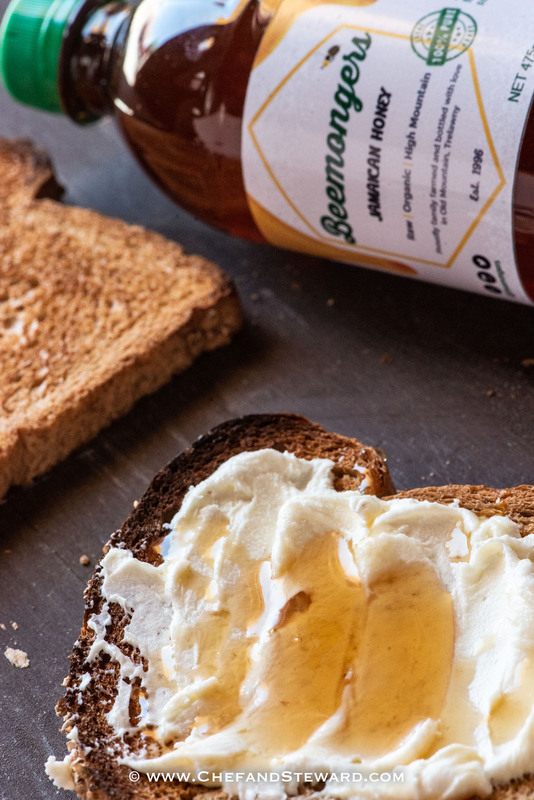 My favourite way to enjoy Marscapone is with our own artisanal Beemongers, raw, organic Jamaican, high mountain honey from my family farm. Additional toppings are just brawta (a little extra as we say in Jamaica). I got Serano ham from Spain, which adds a lovely salty and sweet note. You can also top with bananas and any other fruit or compote. This is the perfect way for kids to experiment with new toppings. This is the most practical recipe for Marscapone cheese, using a whole quart of heavy cream to make 16 oz of creamy, deliciousness that is way cheaper than buying it! In a heavy bottom stainless steel saucepan, bring cream t o a simmer while wishing. Put a sieve lined with cheesecloth or a birdseye cotton cloth over a bowl. Then pour the cream mixture into the lined sieve. Use a silicone spatula to scrape out all remaining cream and then cover and refrigerate overnight (ideally a full 24 hours). 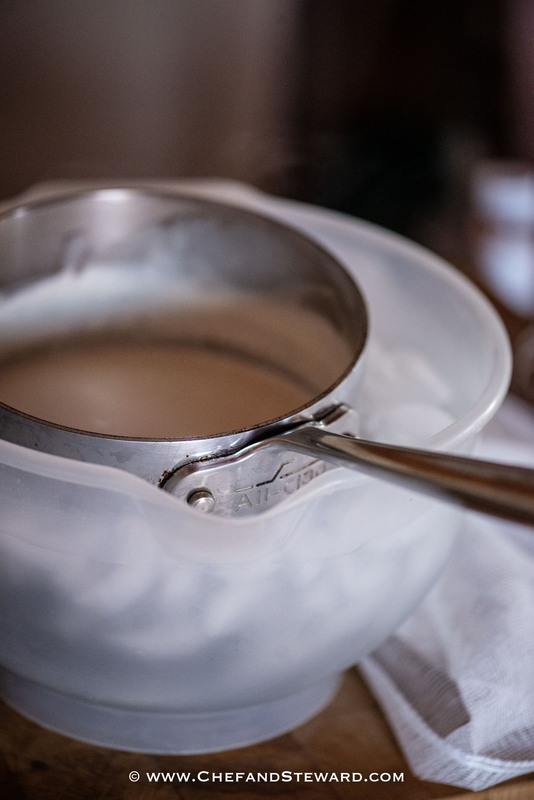 After 24 hours, transfer the cream to a sterilized air tight container. You can store in fridge for another 5 days. 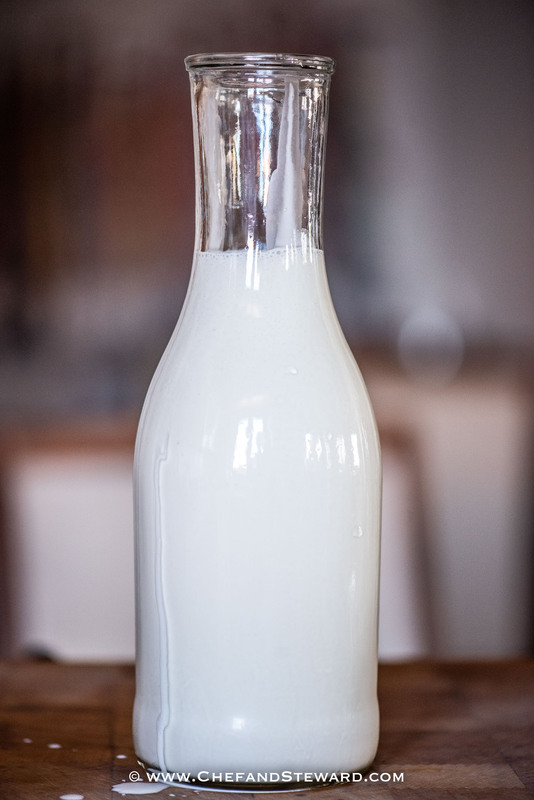 Leftover whey can be used for a variety of purposes including starter culture for fermenting vegetables. I searched for over a year here in town for mascarpone and couldn’t find any. Then all of a sudden I found several sources, and it ain’t cheap. Thank you for the recipe it’s going to save lots of money. This is by far the quickest comment I have ever received so I am certain you are happy to get this one in your inbox Sandra! Thanks for sharing. Trust me, this will save you loads. Thanks you! I am excited to try this this weekend. Superb! Happy that you will! I love making my own cheeses, although I don’t do it very often. I haven’t made mascarpone yet, but I would love to try this recipe. And that toast with honey looks so yummy! Trust me, I have been finding people to share with because I just can’t keep my hands out of it! Just opened a new bottle of our Beemongers honey too! I had no idea that it was so easy to make your own marscarpone cheese! I bet it tastes tonnes better than shop bought stuff too! I have never tried to make any kind of homemade cheese. Looks like an interesting project. Not to mention delicious results too. I love making things from scratch. It’s the creative in me. And the best part is that the proof is in the eating. I love marscapone cheese but have never considered making my own! Thanks for simplifying what I though was a difficult recipe! Yay! Happy to add value to your readership! Wow, what a simple dish. This looks amazing. Thank you for sharing. Homemade mascarpone is so delicious. I love it with both sweet and savory ingredients. Such a great way to amp up a cheese platter or brunch! It most assuredly is. Have you ever made it before Jenni? Mascarpone is one of my favorite cheeses to use in recipes, especially when I’m making a creamy sauce. So excited to finally be able to make my own! Thanks for sharing! I love it too Amanada! So rich and decadent! Homemade mascarpone is not something I have ever thought of doing! Here in Italy, mascarpone is widely available! But after reading your post I so want to make it myself! this is so great! I was actually at the store the other day and had the hardest time finding mascarpone cheese! This is perfect. 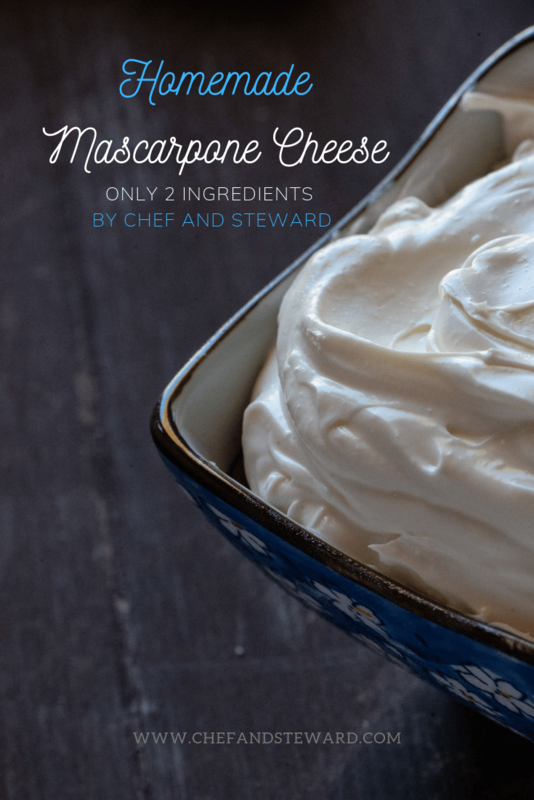 Never fear, Chef and Steward is here… (with a fool proof way to never being out of Mascarpone)! 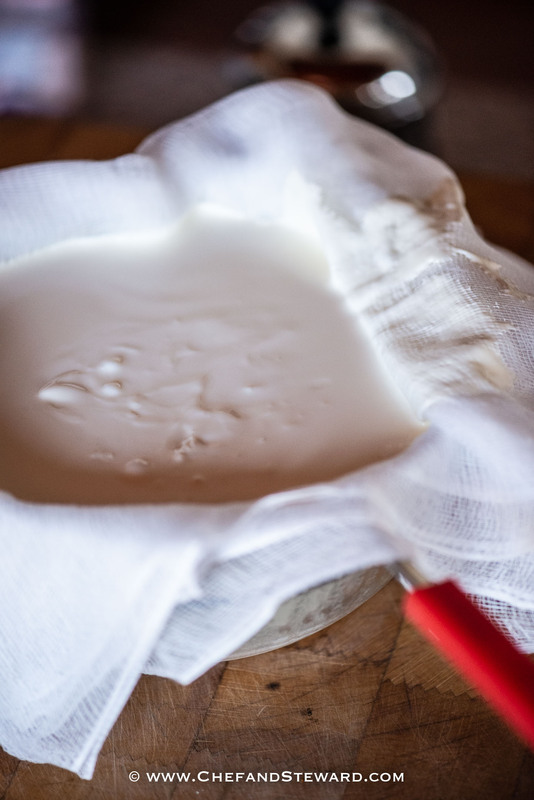 I’ve never made my own mascarpone cheese but this is such a great way to save some money. I’m sure it taste so much better than what we buy in the store too. Absolutely! I love how the slight tang cuts through the heaviness of all that cream. Wow, I’ve never even thought to make my own mascarpone cheese. I had no idea it is so easy! This is awesome, thank you! Have fun making it, I am sure you will! Very easy recipe and money saving. Thanks for sharing your recipe. Happy to! This is one of the reasons my blog has been successful after many years. I can feel you on all the settling buzz. I hope you’ve settled well. Speaking about the recipe, I really like this mascarpone cheese and the fact that it only has 2 ingredients! As an expatriate for over a decade, having lived in 3 countries, I know first hand all that goes into moving and settling in new countries and I think I am just going to rest here a while lol! In the meantime, I will be making all these treats in my Chef and Steward Kitchen. Delicious mascarpone that I need to try ASAP! I have had a few reicpes that I didn’t really enjoy so this is just perfect! Only 2 ingredients? Fabulous! 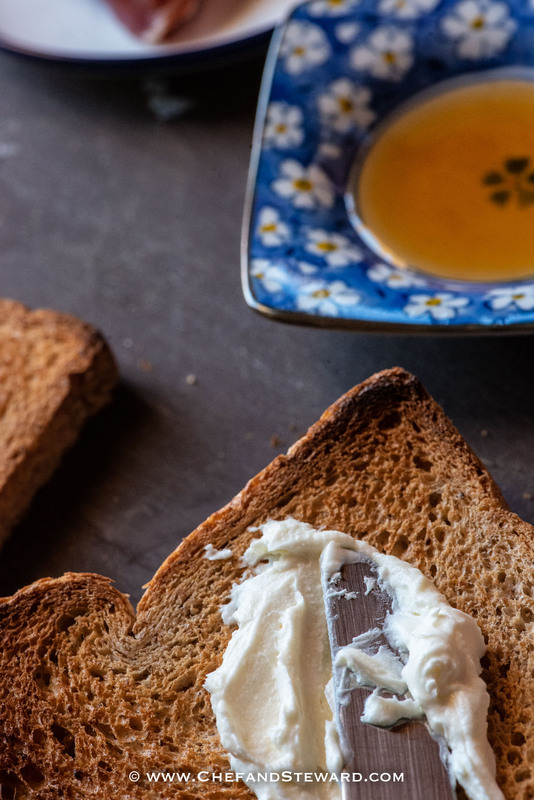 This is absolutely perfect, especially with some really great raw, organic honey. This has my name all over it! 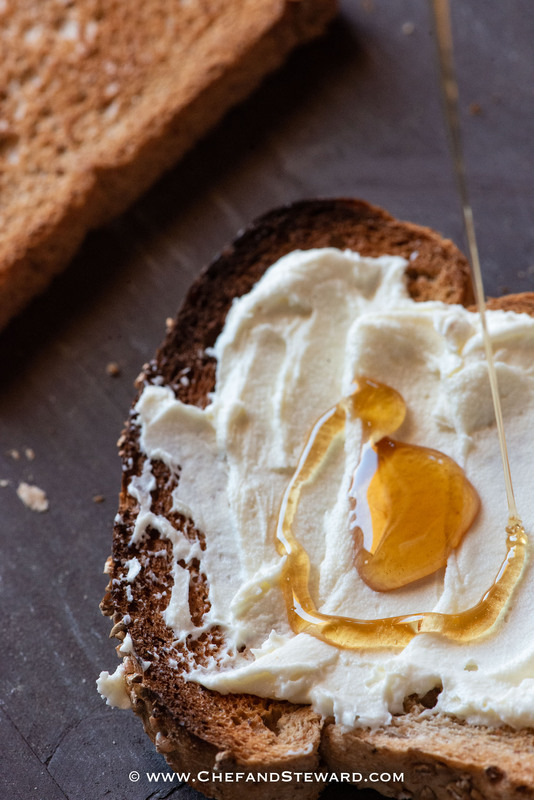 I make ricotta all the time and can’t wait to try this for mascarpone! 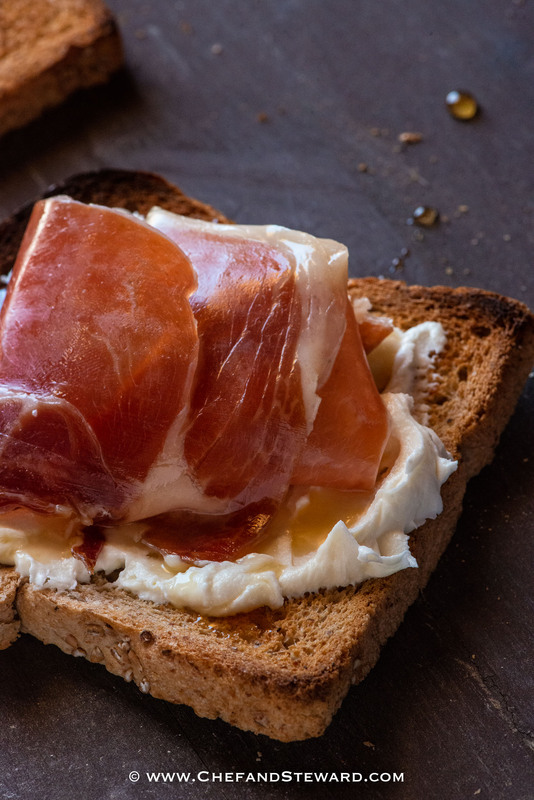 Give me mascarpone, some honey, prosciutto and I’m all set! If you love making ricotta, you will love the added creaminess of the mascarpone. 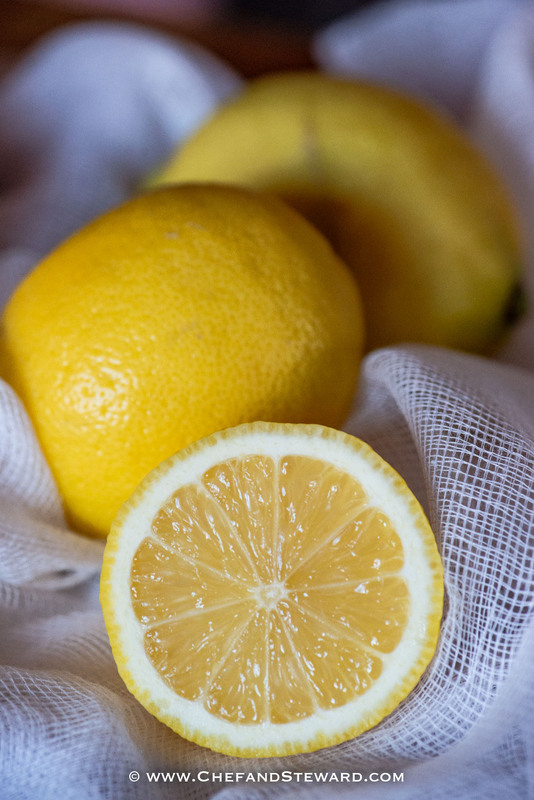 The lemon will add enough tang for it to still feel light on the tongue. I’ve never tried making mascarpone cheese but now that I saw how easy your recipe is, I’ll be making it as soon as I can get my hands on some heavy cream! Great recipe! Yay! I am always happy to hear that I encourage my readers to do something new. Happy mascarpone making! ooooh this sounds like a great idea to make at home – I had no idea how to make mascarpone, but super keen to try it now! Thanks for sharing! Love this! It is so hard for me to find mascarpone cheese around here. I never knew it is so easy to make. This is why I love what I do. I love to add value to my readers and subscribers! How have I never known how easy it is to make mascarpone?!?!? I would have made it ages ago! What a simple, delicious recipe. Can’t wait to try – pinning for later! It is such a conspiracy, right? Now for all that money you will be saving! Thanks for pinning! I think I will try this, your photos have me drooling! I didn’t realize how easy it is to make! Oh thanks so much for your kind comments about my photos. I did this shoot on my own right before the early friday pickup at my preschooler’s Montessori. He came home and wanted to shoot some photos of the setting himself and ended up having some for his afternoon snack, including all that Beemongers honey! I had no idea you could make your own mascarpone. I agree with the other commenter that buying it at the store gets expensive! So I can’t wait to try this thanks for the recipe! Kate, it does! Happy to save another woman some hard earned dollars while still making waves in the kitchen! I didn’t know that mascarpone cheese is this easy to make. The recipe sounds fabulous and love to give a try. You are going to enjoy the whole thing! It is, and the tanginess of the lemon makes it not feel heavy on the tongue so you want to actually plaster it all over everything! I love all things homemade, especially cheese. Mascarpone looks absolutely delicious, so rich and fabulous! Homemade cheese is a bit like therapy… in so many ways. Great stuff! I am loving this so much! 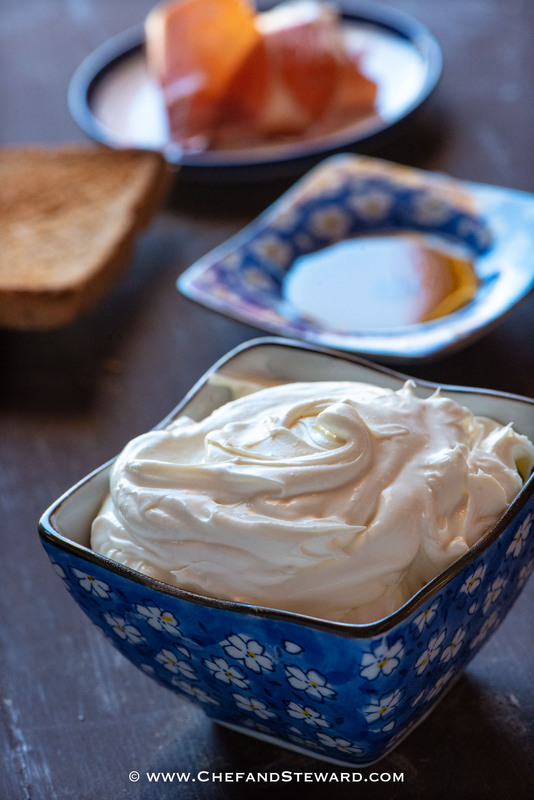 i never thought to make my own mascarpone cheese – what a great idea. can’t wait to try it! You are going to have a ball! I promise! Wear dancing shoes! I’ve been meaning to make homemade mascarpone cheese. And you’re right it is expensive in the store. You get a little bitty container and it isn’t much to taste. This recipe will come in handy — thank you. This sounds delicious and super easy to make. I love mascarpone. But always go and just buy it ins stores. Now I must give this recipe a try. Curious to try homemade version. I hope your curiosity wins and you make it! Tiramisu is my husband’s favorite dessert ever. I’d love to be able to make it for him so this is where I plan to start!! Yes start here for sure! Whoa this post is blowing my mind! Use mascarpone all the time and never made it! Def super inspired to try after reading this and your super clear instructions (and gorgeous pics!). Thanks so much for sharing :). Thanks so much Daniela, it is my joy to provide recipes that really add value to my readers and subscribers!